Whoever said ‘bigger is better’ was definitely onto something. At FishTankBank we realise that the average fish tank is pretty small and doesn’t take up too much room. This is why the majority of products that we include on our site are pretty small and usually no taller than 10 inches tall. We also understand that some people have massive fish tanks (those lucky folk) and can accommodate some pretty huge decorations in their aquariums. With this in mind, we have decided to create this post dedicated to those who like their fish tank ornaments on the larger side (nothing wrong with that). Without further ado, make way for these massive decorations! 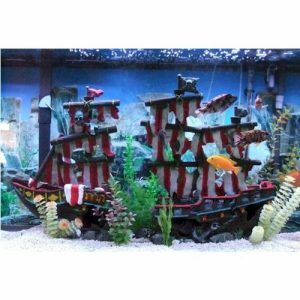 This massive sunken ship is a great ornament that has the potential to become the centrepiece of your aquarium. Not only is it visually pleasing to humans’ eyes, but it is hollow inside, so your fish can happily hide and swim around inside, using it for cover, which is something that fish generally love. One of the user reviews even states that their fish happily spends most of it’s time inside the ship, and usually sleeps in there! Wouldn’t be our first choice of bedroom! You can probably tell from the image above that the ship is a pretty big size, and it stands at around 20 inches tall. If you want more information regarding the dimensions of this item or want to read some of the positive reviews (currently has a 5 star average on Amazon) then click the green button above. These column corners are another great idea for providing some much needed cover and decoration to your fish tank, whilst also helping your fish de-stress. 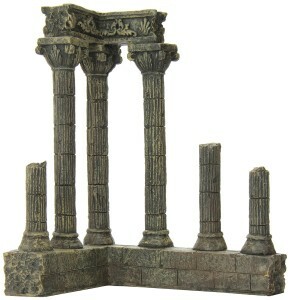 These pillars are only about 10 inches tall, but are also pretty wide, which is why we have included them in this list. You can read more about the dimensions in greater detail by clicking on the green button above. We love this item because it has a Roman gladiator feel that we really dig. The reviews are positive with an average score of 4 and a half stars, and can be useful for finding out some more detailed info about the product. One of the reviews says that their fish enjoy swimming around and in between the columns which sounds cool! Click on the green button to read all of the reviews. 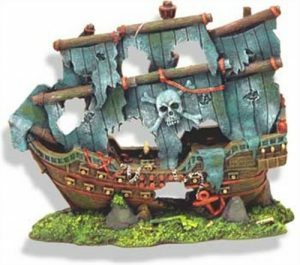 If you’re feeling pretty brave then this cool ghost ship could be an awesome addition to your aquarium! The ship is very well detailed and has loads of little holes which your fish will really enjoy swimming through and hiding in. There are loads of positive reviews for this item, which include some photos from users who have already purchased the item and added it to their own fish tank. One of the reviews is really pleased with how durable the ship is, and says that it has lasted them a long time. Sounds pretty solid to us! Click on the green button above to check out the dimensions and more positive reviews for this item! 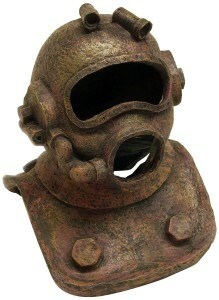 This is by far my favourite decoration on the list as I absolutely love the great detail and just the idea of having a helmet in my aquarium. It looks really realistic and has a great rusted effect which adds to the realism. It has a nice weight to it too, weighing just over a kilogram, and is hollow so your fish can swim inside and around it. It is currently sitting with a 5 star review average over on Amazon so if you love this item as much as I do and want to learn more about it, click on the green button above! So there we have our list of huge ornaments for your fish tank. Decorating with bigger items is a great way to have a focal point of your tank, and also gives your fish more hiding places and cover to explore. Plus, it makes it look pretty cool. Although some tanks won’t be suitable for the items shown above, if you have enough space they can be a great addition. As always with our posts, we have chosen the products based on three main criteria; quality, value for money and customer ratings. We hope that the items shown above tick all of these boxes for our customers. If you do encounter any problems with your order or your item, the details for the sellers can be found by clicking the green button below the relevant item. If no details are shown, feel free to send us an email and we will find the company ourselves. We use Amazon to handle and dispatch all items as we know they are a professional company who will get your delivery to you quickly and efficiently. Feel free to explore the rest of FishTankBank and have fun!